Jackie Chan, a keen philanthropist, a UNICEF/ UNAIDS Goodwill Ambassador and international film superstar arrived in Cambodia on Tuesday. Jackie Chan, in Cambodia known as Chin Long, will give speech on arts and culture as a pathway towards peace at the University of Cambodia (UC) today at 2pm, a press release from International Peace Foundation (IPF) said. 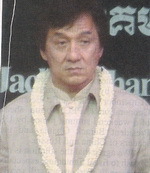 The IPF and UC are Cambodia the co-organizers Jackie Chan's visit. Jackie Chan joined a singing ceremony with famous Khmer singers, including Preab Sovath, Meng Keo, Pich Chenda and Hoem Sivorn, at the South East Asia Television (SEATV) station from 4-6 pm yesterday. Hundreds of students and supporters crowded the area. Jackie Chan is a Hong Kong actor, action choreographer, film-maker, producer, martial artist, screenwriter, entrepreneur, singer and stunt performer who has appeared in over 100 films, press release said, adding that Jackie Chan is a keen philanthropist and a UNICEF/ UNAIDS Goodwill Ambassador, having worked tirelessly to champion charitable works and causes. He has campaigned for conservation, against animal abuse and has promoted disaster relief efforts.